A refundable £100.00 deposit is required to secure a booking, with the balance payable 8 weeks before the holiday. 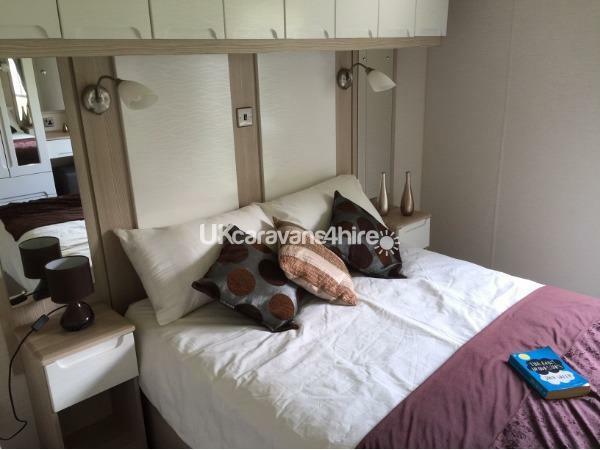 This deposit is required to cover any damage or loss to the caravan or its contents, refundable after the holiday provided there has been no damage or losses; this is not included in the cost of the holiday. Entertainment passes are not included in the prices quoted but may be purchased on arrival at the Park. Our holiday home offers you a sanctuary of peace and quiet away from the stresses of the outside world! 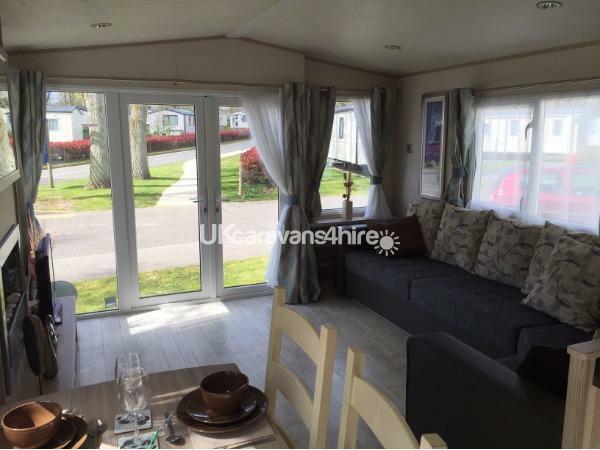 It is well equipped and has patio doors opening out onto decking, central heating and double glazing throughout; you will be so cosy and comfortable you won't want to leave! It is located in the prestigious Waterways area on a spacious plot with patio area with garden furniture, ideal for dining al fresco. You will find those little extras for your convenience, eg: cleaning products, washing-up liquid, kitchen towels, foil, cooking oil, hand soap and toiletries. There are also items such as a hairdryer and straighteners to save space in your packing. 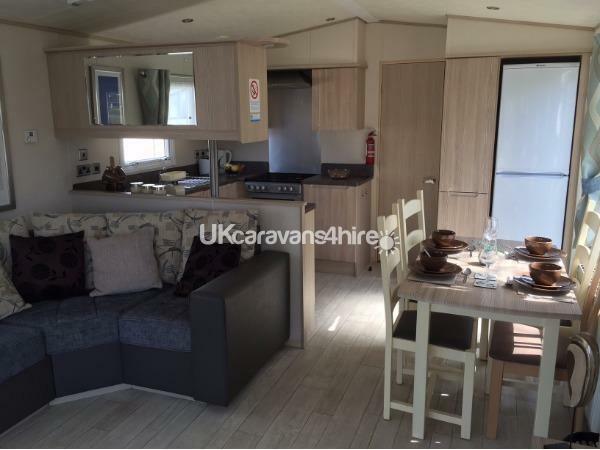 KITCHEN: The kitchen is ultra modern and well equipped with a full-sized gas oven and hob, full-sized fridge/freezer, microwave, toaster, kettle, cookware, full range of china, glasses and cutlery. Children's cups, plates and cutlery are available for our young visitors. There are ample cupboards. Tea, coffee, hot chocolate, sugar and condiments are all provided for use during your stay. DINING AREA: Modern freestanding rectangular table and 4 chairs. LOUNGE: The spacious lounge is very stylish with patio doors opening out onto decking; coffee table, and for added warmth, a modern electric pebble-effect fire. The sofa converts to a double bed. Entertainment comprises of a 32" full HD TV with Freeview, DVD player and DVDs for adults and children and a vast selection of games and books to add to your enjoyment. MASTER BEDROOM: Stunningly attractive and very spacious and can easily fit a travel cot at the end of the kingsize bed for that extra peace of mind. The bed has a luxuriously comfortable mattress, bedside lights, overhead storage, 2 double wardrobes with coat hangers and dressing table. 19" flat screen tv. En-suite with wc, sink and shelving unit. Duvets, pillows and bed linen are provided and beds will be ready made on arrival. There are protectors on all mattresses and pillows which should not be removed on your departure. 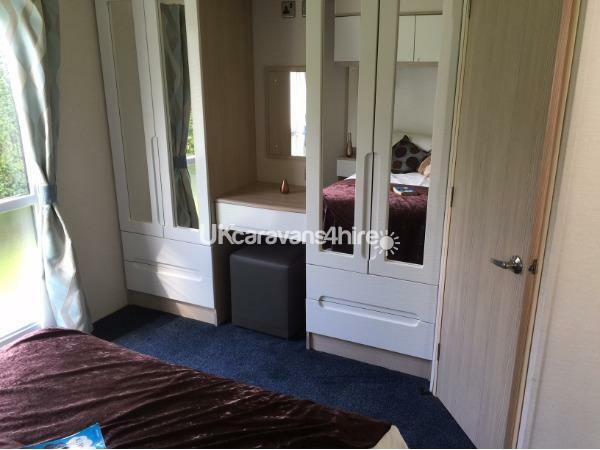 TWIN BEDROOM: Twin beds (can be made up to a double) with overhead storage, wardrobe, coat hangers and drawers. BATHROOM: The modern, luxurious bathroom has a wc, hand basin, shelves and large double shower cubicle with toiletries for your use and also children's toiletries. Please bring your own towels and tea towels. 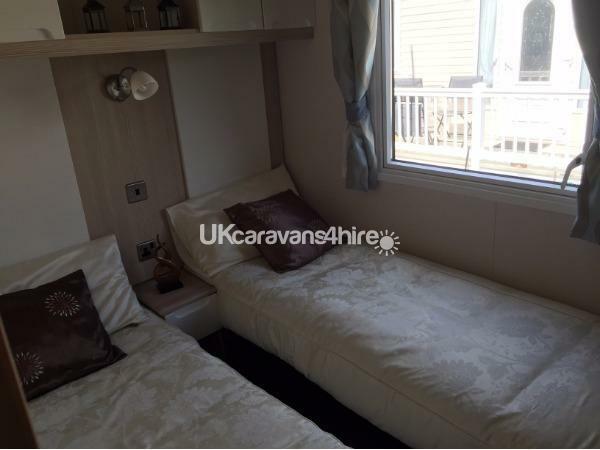 The caravan is fitted with working smoke and carbon monoxide alarms for your safety. Please test these on your arrival. OUTSIDE: A south facing plot with patio area and side sea view. There is a wooden picnic table (seats 8) with sun parasol on the patio for the ultimate in al fresco dining. 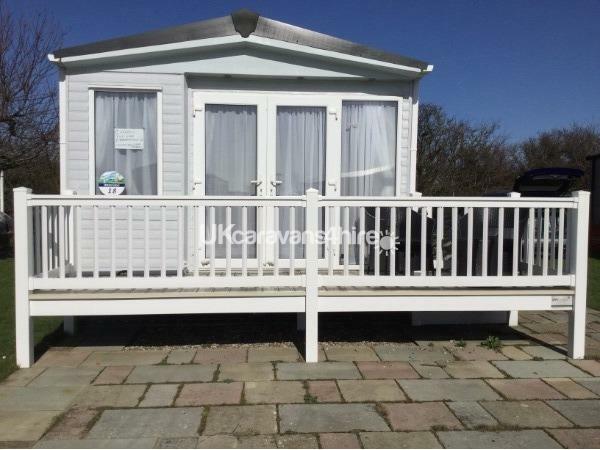 There is also a decking area to the front of the caravan with rattan furniture to enjoy a glass of wine in the evening and watch the fabulous sunsets. PARK DETAILS: The park is situated between Great Yarmouth and Lowestoft tourist areas. Hopton was voted best Haven park of the year 2016, exclusive and well maintained, offering a vast range of sports activities during the day and live entertainment for adults and children, day and night. All amenities are within a five-minute walk via safe footpaths ie golf course, shop, direct access to the beach, entertainment centre which incorporates heated indoor and outdoor swimming pools (refurbished in 2016), restaurant, bar, access to sports facilities, eateries and much more. Just a short drive away you can hire a boat on the Broads, visit theme parks and places of interest, Africa Alive, greyhound racing and horse racing to name but a few.